Today we visit the beautiful Pigeon Falls in the Allegheny National Forest near Marienville, PA. 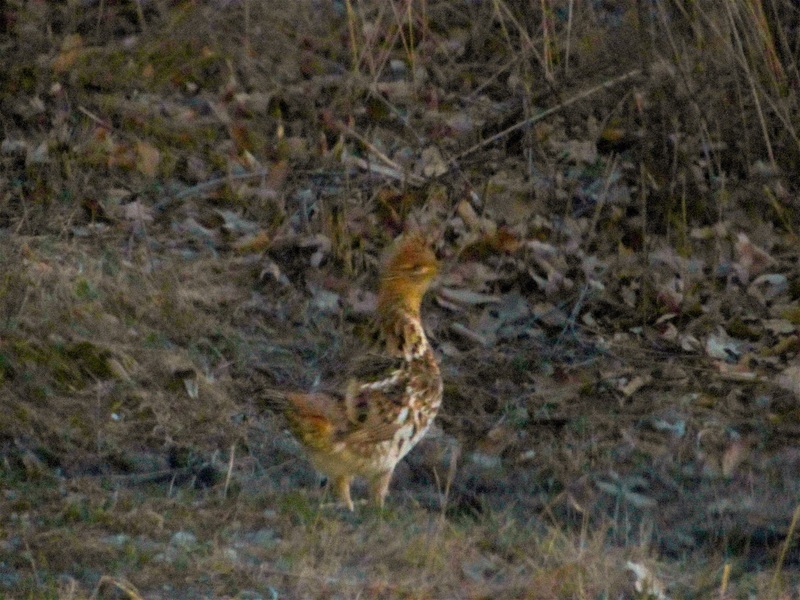 It is located deep in the woods off of a small gravel road. The coordinates to the falls are 41.5883, -79.1581 and the hike is maybe a half a mile, tops, through some beautiful lichen covered boulders, beautiful woods, and habitats of wildlife. As I approached the falls, I spooked a white-tailed deer that hopped back into the woods after snagging a drink from the creek. This is a beautifully serene set of falls that is relatively untouched, lying pretty deep in the woods. The first sight you see as you descend into the valley. These falls are no more than 20 feet tall, but they are really beautiful. A great place to just sit and relax for a while. Very serene and deep in the middle of nowhere. Gotta slow it down a little bit! The tiers on this set of falls make this especially beautiful. The way this creek maneuvers through this rugged terrain make this set of falls very neat. The maneuvers of the other regional falls, including the spectacular Hector Run Falls, take unique pathways through the terrain as well. I highly recommend visiting this stunning little set of waterfalls. There are a ton of points of natural interest that are located within a short distance of these falls, including the aforementioned Hector Run Falls, Pigeon Falls, Kinzua Dam and Allegheny Reservoir, Cook Forest, Kinzua Bridge and Elk Country, and more. I love taking relaxing drives on the Lincoln Highway. There are so many fun things to check out along the way, and it seems that each time we make the drive, we find something else that is spectacular. Once you get to the top of Sideling Hill, on the eastbound side of the road you will see a little picnic area. The picnic area would be an excellent place to stop with a picnic lunch. They even have a small playground area. While this is beautiful, the main beauty lies just a bit further down the road. The 69,000+ acres of Buchanan State Forest are within three counties, Fulton, Bedford, and Franklin. It is named after the fifteenth president, and the only to ever come from the state. These structures date back to the CCC in the 1930s. The entire area is heavily forested and tremendously beautiful. The CCC camp that did this work was closed in 1937, along with three other camps throughout Buchanan State Forest. Two of the camps were turned into picnic areas, and another was used for POWs in World War II, and another was reused as a place for conscientious objectors to World War II to do service for the country. They worked on a bunch of projects, including erosion control on what is now the Abandoned Turnpike. The longest tunnel ever built for the Turnpike, measuring in at over a mile long, runs underneath this spot. The Sideling Hill Tunnel sits in abandonment and in full darkness. It is a thrill to explore. I am sure that this fire tower offers a killer lookout, but it is not open to the public. The scenery around it is beautiful enough to warrant driving up to it. This view is looking east towards lots of farmland in the valley and the next few mountain ranges. There are stunning views throughout the drive across Sideling Hill through the Buchanan State Forest. This road runs roughly 12 miles from the Lincoln Highway, atop Sideling Hill and through Buchanan State Forest. This drive is one of the most scenic in the state, and a rare road that travels along the top of a mountain for a long distance. There are numerous trails throughout this area, in addition to tons of wildlife. Very few people seem to go through this area, so you see tons of wildlife, and since the road travels along the top of the ridge, views are afforded when you look in either direction. Blurry, but you get the idea, DEER! We always love seeing wildlife. A beautiful sunset. I believe this was in State Game Lands 65, just down the road. 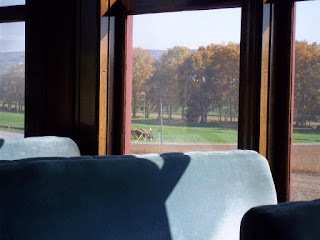 There is a terrific view of the Narrows, where the blue Juniata River crosses through the Alleghenies and the Turnpike, Lincoln Highway/Route 30, and the original Forbes Road. 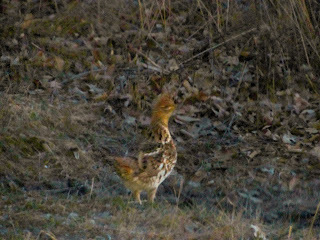 We even saw our state bird, the Ruffed Grouse! Spectacular and funny bird. We highly recommend taking a little detour off of the Lincoln Highway at Sideline Hill to drive across the ridge through the Buchanan State Forest. This is an absolutely beautiful drive with multiple awesome scenic vistas and hiking trails. It all starts at Bark Road and Route 30, at the top of Sideling Hill. One of the finest drives in the state. It is time to start planning some autumn adventures! We have visited places all across the state during autumn, and these are some of our favorites. Whether you open your door and look outside, or if you go to your local state park, you are sure to see some beauty. The following are just a few of our absolute favorite places to check out in autumn, thanks to their exceptional beauty. 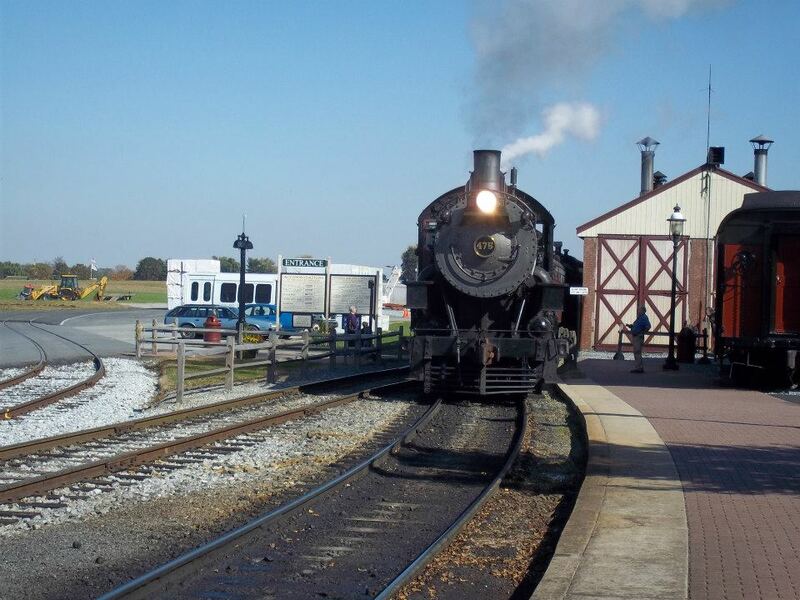 There are a ton of fun sightseeing opportunities and activities going on in the Pocono region of the state. One of my favorite places to check out is Big Pocono State Park, high atop Camelback Mountain Ski Area and Resort. This overlook gives you a wide expanse of view over the Poconos, and to as far out as New Jersey and New York. There are also a ton of different activities to do at Camelback, including an alpine roller coaster, zip lining, and more. 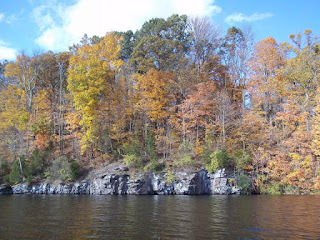 There are also a plethora of different places to see throughout the Poconos. One of the four pristine early 20th century steam locomotives of the Strasburg Railroad. Hard work ethic is what makes Pennsylvania what it is. 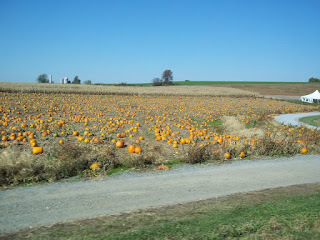 At no place is this more evident in the state than riding through Amish Country on the Strasburg Railroad in the fall. Amish farmers are tending to harvesting the crops they have worked so hard to tend to throughout the year. Around the area, you will find freshly baked goods and harvested crops. 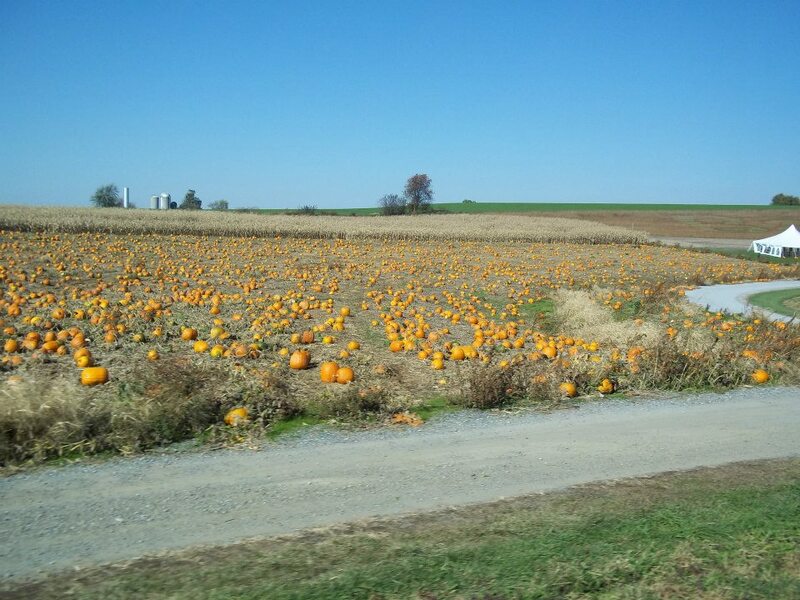 A pumpkin patch next to the railroad. If the call of the wild beckons, Elk Country in the PA Great Outdoors Region in Benezette, PA is where you want to go. Autumn is the time of the rut, when the Elk practice their mating rituals. You will see male suitors duke it out, grunt, stomp, and lock antlers and compete while their potential mate watches. It is a spectacular sight. Couple that with the fall colors, especially at the nearby Marion Brooks Reserve with its amazing grove of birches, and the rest of the attractions in the PA Great Outdoors Region, and you have a terrific place to go in the fall, in addition to the nearby Kinzua Bridge. This region is perfect. If you live in Pittsburgh, a great place to go spend a weeknight or afternoon is at Schenley Park. As one of our nation's largest urban wooded areas, you are bound to find beautiful colors at every corner of the park and throughout the CCC, Great Depression era, infrastructure throughout the park. The Route 40 Overlook in Hopwood, deep in the Laurel Highlands and near Ohiopyle State Park, Fallingwater, and Laurel Caverns. This overlook looks over a deep crevasse and Uniontown. The colors are especially vivid at this spot, in addition to Ohiopyle State Park. Fresh grapes? Need I say more? Between the cool colors, the smell of harvested grapes lingering through the air, and the always awesome views of Lake Erie, North East, PA is an awesome place to sit and relax. Be sure to check out the dozens of wineries and vineyards up and down the shores of Lake Erie. There is nothing like fresh grapes! Tunnelview Park is home to multiple generations of canal and rail history, with three transportation related tunnels, and accompanying bridges. This is a spectacular and often overlooked spot, deep in the Loyalhanna Gorge. Read more about this awesome place from this article about an autumn visit and one from a winter visit. Mingo Creek Park in Washington County is a place that takes its covered bridges seriously. They have two beautiful covered bridges, including one that was moved and saved from demolition. The autumn colors are especially vibrant in this location. For more information on visiting, check out our article on this awesome place. The Renzie Park Rose Garden in McKeesport is the result of decades of hard work by community members through the Garden Club of McKeesport. The fall roses, coupled with the colors of the trees of the arboretum, make this an exceptional site to take in the sights of autumn. 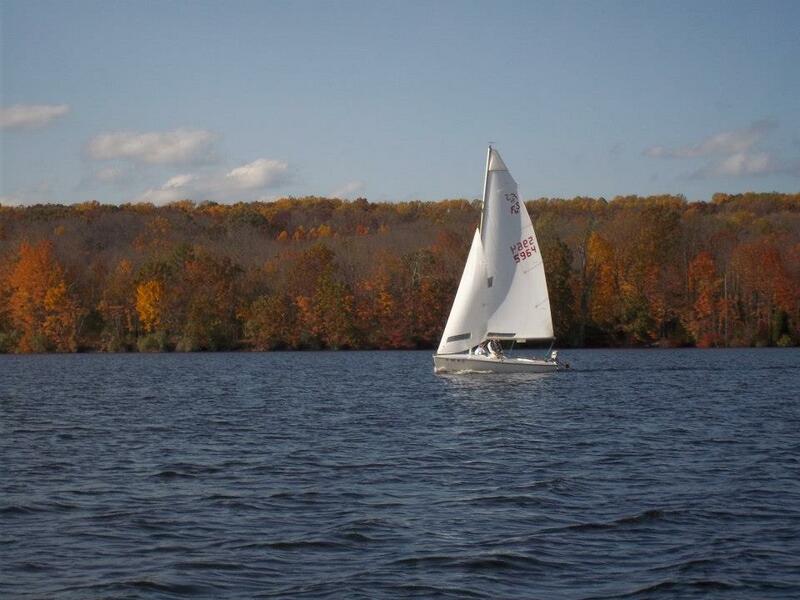 There is nothing quite like the feeling of crisp autumn air when you are out on the water. 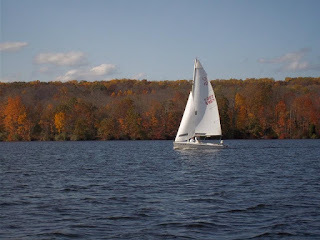 Lake Nockamixon at Nockamixon State Park is an awesome place to go during the fall months for these reasons. Additionally, the leaves seem to get exceptionally colorful in this location. Horseback riding, hiking, boating, sail boating, and more await visitors to this awesome state park. Nearby, you can also check out the funky Ringing Rocks County Park, home to an exceptional geologic wonder. 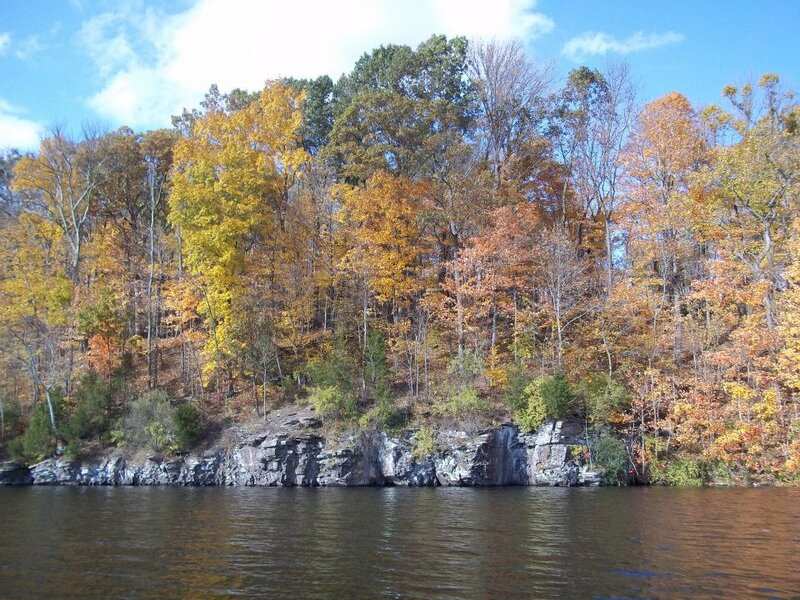 For more information on visiting, check out our article on Nockamixon. 13) Right outside your door! Autumn is stunning in PA, so get outt there and appreciate it! This list is far from all encompassing, but these are places you should plan to see at least once during the fall months. Have a great time! Kidds Mill Covered Bridge in Shanango, PA, Pymatuning Township, Mercer County. Kidds Mill is one of only twenty remaining Smith Truss bridges in existence, the only one that is in Pennsylvania, the easternmost example of this bridge in the country, and the only remaining covered bridge located in Mercer County. This bridge is located within 15 miles of the Ohio border, so it is no surprise that this bridge is located not terribly far from the home state of the Smith Truss company. Regardless though, this is a pretty bridge. This span has faced some graffiti tagging vandalism. The bridge measures in at roughly 120 feet and it really seems huge once you go through it. If you are in the area, be sure to check out this beautiful covered bridge, along with the rest of this remote area. 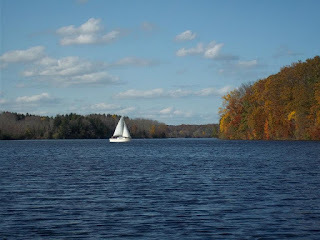 Springfield Falls, Wendell August Forge, Seven Sisters Bed and Breakfast, the Pymatuning Spillway, Conneaut Lake Park, and other attractions, are located not too far from this location.